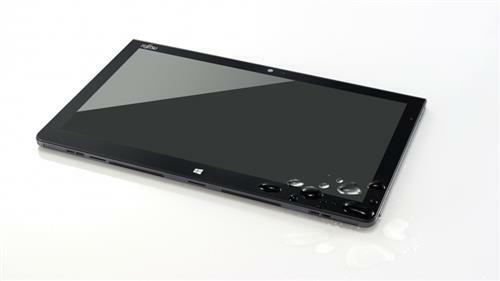 The Fujitsu Q704 is a rockin’ but pricey Win8.1 tablet when fully tricked-out. The bad news is that this sucker is extraordinarily expensive. Just for grins, I jumped onto www.shopfujitsu.com to configure a top-of-the line Q704, and nearly fell over when it priced out at $2,852.00, including a $50 off promotion code I was able to find and put to work. For that money, the build includes a Core i7-4600U CPU (dual core, 4 threads, 2.1 GHz clock with 3.3 GHz max turbo, 4 MB cache, 15W max TDP), 8 GB RAM, built-in GPS, 256 GB SSD, a keyboard dock with external battery, NFC, and a SmartCard reader. But still, this is nearly $1,000 more than a similarly configured Surface Pro 2, so you’re paying a hefty premium for the four hours of additional battery life and added processing power that this unit should deliver. Still looks like a great machine, though, and one worth pondering at length. Pick the “Customize” button in the middle column on the Fujitsu store’s Q704 page to configure a system to your heart’s content, too. Will the “chancellor of the exchequer” here at home (my wife, that is) authorize such an extravagance? Not bloody likely!! But it’s still nice to dream a little … or a lot, as is the case here.